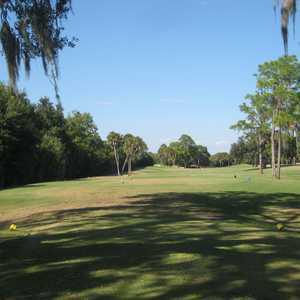 SARASOTA, Fla. -- Serenoa Golf Club isn't the longest golf course in Sarasota, but it might play the longest. The opener at Serenoa Golf Club is the top handicap hole on the course. Stay left, or get wet. At 6,333 yards from the tips, there are plenty of longer courses in the area. But designer Mark Alden decided to tear up any preliminary plans to make Serenoa a typical Florida track, bringing water into play on every hole and making it a shotmaker's course. And he succeeded. Serenoa isn't the typical Florida golf course (with a tee shot aimed at one of the bunkers on either side of the fairway and an approach over water that doesn't always come into play). The water at Serenoa can swallow up any errant shots that miss the mark. The fairways are reasonably wide, but you have to keep it in the thin grass. There are not a lot of trees, but Serenoa defends itself with water and deep bunkers around the greens. "You can score on this course if you keep it in the fairway," said Ronald Wilkins of Bradenton, a Serenoa regular. "If you stay out of the traps and out of the water, you can do well here, but it plays a lot longer than it looks. To keep it straight, you might not want to hit the driver off the tee, so that means you better be able to hit your mid-irons and stay out of the sand." Serenoa starts with a 440-yard par 4 that is the No. 1 handicap hole on the course. Water runs all the way down the right side from tee to green and bends around the right side of the green. The fairway is relatively wide, but keeping it left is the only way to par the hole. Don't get cute and play around with the right side. There isn't a par 4 longer than 400 yards after the opening hole, but keep the driver in the bag after No. 1 because the doglegs make things difficult. The back nine is the shorter of the nines, but it plays even tougher with tighter doglegs and even more water. The 11th is a par 3 that plays to 190 yards, but if you go right you get wet and if you go left you are on the beach because there is sand everywhere. The wind is the key to battling Serenoa. Many of the holes can require anything from a hybrid to an 8-iron on the approach. No. 16 is another monster. It's only 370 yards, but it requires a forced carry over a deep ditch for the approach. It's up to you to decide how much you want to cut off. That's the first of three tough holes to end the round. You have to hit it a straight tee shot at No. 17. A quagmire lines the fairway, but a straight drive can lead to a birdie. The closing hole is a 495-yard par 5 that features a severe dogleg left with water all the way down the right. It's reachable in two, so a long hitter can think about eagle, but trying to cut off too much could be big trouble. "It's a tough course, but it is in perfect shape," said Matt Napolitano, the director of golf at Serenoa. "It is tough, but if you hit it straight, it's a great round of golf." A golf trip to Sarasota can really pay off because Serenoa is surrounded by plenty of great courses and hotels for any budget. The course is about an hour from the Tampa International Airport, but flying into the smaller Sarasota-Bradenton International Airport might make for a shorter commute. A trip to Sarasota is well worth it. The Gulf of Mexico, with some of the best-rated beaches in the nation, is only about 20 minutes away. 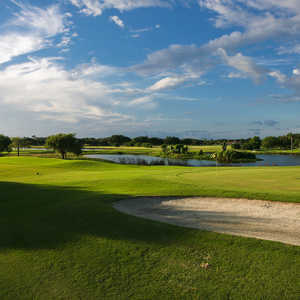 Sarasota is one of the best golf destinations in America, and Serenoa Golf Club is only part of it. It's one of the toughest courses in the region, but you can make an entire week of golf without even leaving Sarasota. 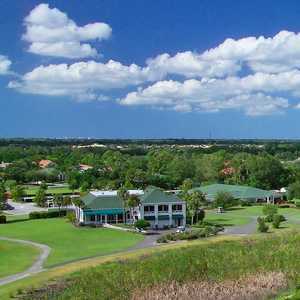 Serenoa is in excellent shape year round and is well worth being included into any Sarasota golf trip. Making it even better are the great beaches, fine restaurants and plenty of lodging in the area.